Quicksilver, a water shuttle service operated by Pendleton Yacht Yard, has been offering discounted rates and new trips to compete with the state's ferry service after a ticket price increase that took effect this week. Pendleton is weighing whether or not to continue that service in the future. ISLESBORO, Maine — Amid an island’s heated squabble with state officials over a sudden spike in ticket prices, an Islesboro water shuttle is offering discounted “boycott” rates for a week and weighing whether to try to compete long term. “When we heard that the rate hike was coming, we wanted to offer a cheap alternative,” Ben Smith, Quicksilver’s captain, said Wednesday. There was “no love lost” between the islanders and the ferry service in the wake of the hike, he added, and the goal was to “take away some of [the state ferry’s] business,” while showing solidarity with locals. 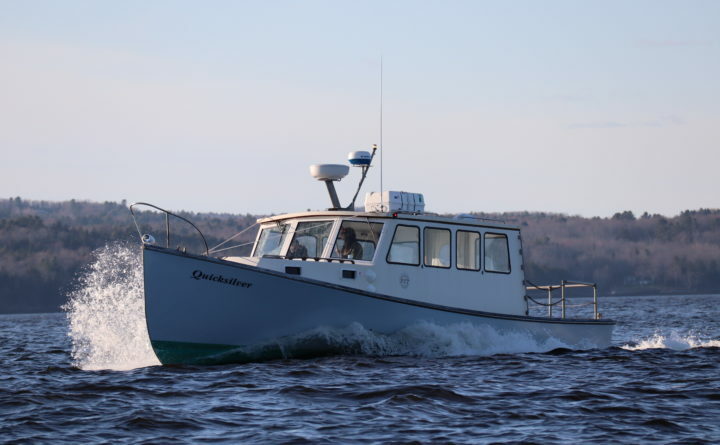 Quicksilver is a 25-year-old boat owned by Islesboro-based Pendleton Yacht Yard. Traditionally, the boat has run chartered trips and acted as an auxiliary service at times when the busy state ferry that motors between the island and Lincolnville wasn’t running. That changed this week, when the state’s new fare rates went into effect. It doubled the cost of some Islesboro route tickets, taking a big bite out of the pocketbook of residents who make regular, if not daily, trips off the island. Previously, Islesboro residents paid the smallest ticket price in the ferry system because their trip was the shortest and busiest of any of the islands served by the Maine State Ferry Service. Other islands saw their ticket costs remain relatively flat or drop dramatically under the new flat rate structure. A group of Islesboro residents sued the Maine Department of Transportation on Wednesday, claiming the rate hike was unfair and unconstitutional. Depending on how in-demand the service is, Smith said Quicksilver might keep the rates and routes to compete with the state ferry. So far, Quicksilver has taken about 75-80 passengers per day, and has had to turn people away due to capacity limits on a few high-traffic trips. Quicksilver has several disadvantages. It can only take 24 passengers at a time. The state’s ferry that serves Islesboro, the Margaret Chase Smith, is five times as long and can transport vehicles. Residents have vented frustrations, saying the rate hike will make it harder for their businesses to compete because of the increased costs of bringing things to and from the island. Others have said they’ll struggle to afford to commute to work or run errands on the mainland. “A lot of individuals and businesses have made a lot of sacrifices to make this a vibrant community and the ferry service is doing a lot to tear that down this month,” Smith said. State ferry service officials have argued that the flat rate is the most equitable way of raising revenues to avoid a looming budget shortfall. It also simplifies ticketing and allows people across the state to use new technologies that it says will improve its services on all its routes. One of the biggest factors in the state’s decision to go with a single flat rate was the desire to keep down truck rates, a per-foot fee paid by companies or individuals bringing heavy trucks onto the ferries. Increasing truck rates mean an increased cost of doing business for anyone trying to transport goods on the ferry. Under other proposals the state considered, the truck rates would have increased across most islands. The new rate structure puts the truck rate at $2.50 per foot, a decrease on all islands except for Islesboro, which currently has a $1.75 truck rate. The fee for Matinicus was $6.75 per foot.